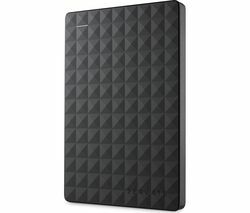 When you need to free up space on your computer or you want to back up your important files, photos, music and more, an external hard drive gives you the space and security you need. Seagate external hard drives are renowned for their reliability and capacity and available in a wide range of sizes. Hard drives are an essential part of any computer, storing all vital data, documents, movies, music, photos and programs. If the hard drive on your computer becomes damaged you could lose it all. That’s why it’s important to set up a backup system that you can copy your important files to. External hard drives provide a simple and reliable way to back up large amounts of data, and the Seagate external hard drive range is packed with features that make managing your files a doddle. Available in 2TB, 3TB, 4TB, 6TB and 8TB capacity, it’s easy to find an external hard drive to meet your demands without having to overspend on storage you might not need. 1TB is enough to safely store hundreds of movie files or hundreds of thousands of MP3s or photos. With the Backup Plus range, you can use the Seagate mobile app to back up all of your important pictures and videos to the Backup Plus or the cloud. Automatic backup comes as standard, meaning you don't need to worry about losing files or folders again. You can set your own automatic backup schedule and control these back ups from your phone. All Seagate external hard drives use speedy USB 3.0, which means you can take advantage of transfer speeds up to ten times faster than USB 2.0. But they’re also compatible with USB 2.0, so don’t worry if you have USB 2.0 connections. These hard drives also allow you to switch seamlessly between PC and Mac without formatting thanks to the NTFS driver included. Whatever your storage needs our extensive range of hard drives is designed to never let you down. For more options for storage on the move check out the latest portable hard drives and USB flash drives on sale.